Mmmmm.... why is it that the first watermelon of the year is ALWAYS the best watermelon of the year? Mmmmm! We bought our first watermelon yesterday! Delish! I can't wait to have watermelon. I stopped at a stand the other day and they wanted $7.99 for a watermelon! I'll just have to wait until they are more in season in my area. Hope you enjoy your yummy watermelon! 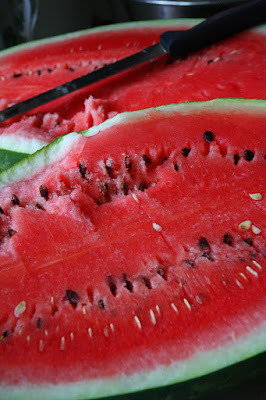 We have been enjoying lots of watermelon these days, too...so yummy! Glad you found a sweet one tho!